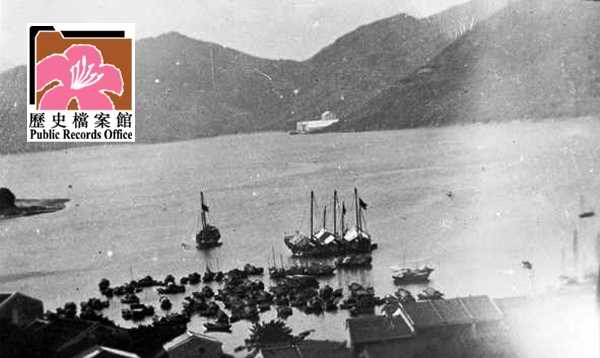 HF: The Hongkong Milling Company had a brief existence during the early part of the 20th century. Things ended tragically when its prime founder Alfred Herbert Rennie committed suicide by throwing himself off the company launch taking him to the Mill. The company, a major industrial enterprise at that time, is almost forgotten. I wonder also how many people remember the nearby Rennie’s Mill a small town developed by Koumintang refugees fleeing from China after the establishment of the PRC. It was flattened immediately prior to the return of Hong Kong to China in 1997 which was unlikely to have been a coincidence. 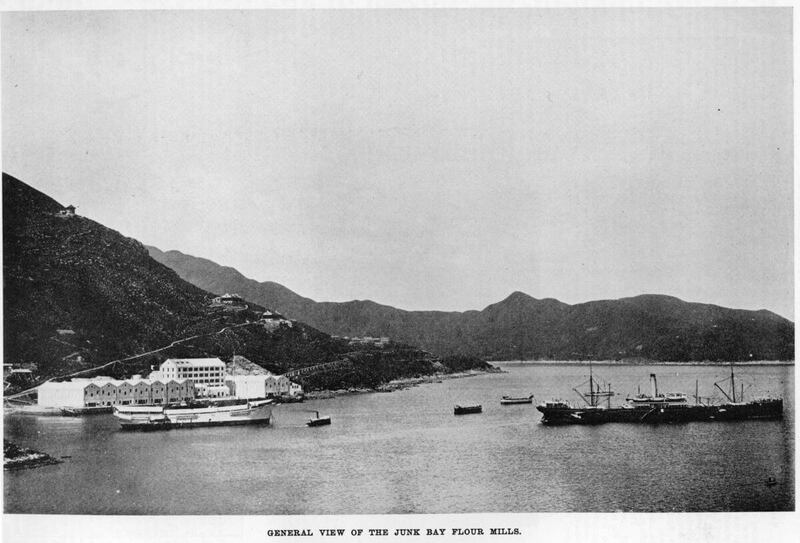 IDJ writes – the following article and photograph come from a book titled “20th Century Impressions of Hong Kong” originally published 1908 but republished in 1990 by Graham Brash (PTE) Ltd of Singapore. Many thanks to John Smith for typing out the article. Its sustained optimism is in stark contrast to how Rennie and his mill rapidly came to a tragic demise. 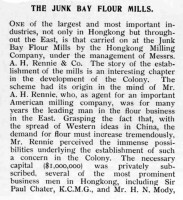 One of the largest and most important industries, not only in Hongkong but throughout the East, is that carried on at the Junk Bay Flour Mills by the Hongkong Milling Company, under the management of Messrs. A. H. Rennie & Co. The story of the establishment of the mills is an interesting chapter in the development of the Colony. The scheme had its origin in the mind of Mr. A. H. Rennie, who, as agent for an important American milling company, was for many years the leading man in the flour business in the East. Grasping the fact that, with the spread of Western ideas in China, the demand for flour must increase tremendously, Mr. Rennie perceived the immense possibilities underlying the establishment of such a concern in the Colony. The necessary capital ($1,000,000) was privately subscribed, several of the most prominent business men in Hongkong, including Sir Paul Chater, K.C.M.G., and Mr. H. N. Mody, taking a large share in the venture. With untiring energy Mr. Rennie personally super-intended every detail of the erection of the magnificent pile of buildings and the installation of the intricate and scientific plant, which make up the mills to-day. Many ingenious devices in the equipment of the mills for the saving of time and labour bear striking testimony to the fertility of Mr. Rennie’s invention. The Company having acquired some 435 acres of land on the shores of Junk Bay, with a sea frontage of 2 miles, Mr. Rennie turned the first sod in May, 1905, and the work was pushed forward with such rapidity, in the face of many difficulties, that in January, 1907, the mills were ready for formal opening by the Hon. Mr. F. H. May, C.M.G., at that time the officer administering the government. The magnitude of the enterprise is clearly shown by the fact that the mills are capable of producing 8,000 bags of the highest grade flour every twenty-four hours, which means that about 6,000 tons of wheat pass through its machines every month. This entitles them to rank with the largest flour mills in the world. The godowns are substantially built of brick, with steel stanchions and principals and iron roofs, and have a storage capacity of about 26,000 tons of wheat, 250,000 bags of flour, and 10,000 bags of bran. Elaborate apparatus has been installed to facilitate the handling of wheat and flour, and very particular attention has been given to ventilation. The mill is a five-storey building, and the machinery is of the most approved and modern roller plant, with complete washing apparatus and electric bleachers. The motive power consists of two 250 horse-power and one 150 horse-power Diesel engines. Electric light is used throughout, and special precautions have been taken against fire, the buildings being shut off from each other by fire-proof doors, while an abundant supply of water at about double the pressure of that in the Hongkong mains is procured from the Company’s own reservoir situated about 2 miles away. Both in the godowns and in the actual milling processes the utmost cleanliness is insisted upon, and the result is shown in the excellent quality and colour of the flour produced, which is in great demand not only in China but also in Japan, Indo-China, the Straits, Burmah, and India. The mills run throughout the whole twenty-four hours, except on Sundays. As Mr. Rennie appreciates to the full the wisdom of looking properly after good servants, every possible consideration is given to the employés, who are housed in bungalows on the hill side and on the hulk Maple Leaf, formerly a sailing ship, moored off the mill, which is electrically lighted and supplied with fresh water from the shore. Strict precautions are taken to ensure healthful conditions on board, and there has been practically no sickness among the employés, who number about 125, since the mills started. The Company does not confine its attention to flour, for a plant is in course of erection which will produce 24 tons of the best quality clear ice every twenty-four hours, and the establishment of a brewery and aërated water factory is also under consideration. The mills are a valuable addition to the assets of the Colony, for they could at any time, if necessary, supply the entire population, including naval and military forces, with food for a period of at least four months. Rennie’s Mill in the background, 1913. I see what looks like a pillared ramp going up to the right of the mill. And then a path (?) leading up two buildings above and to the right of the mill. I wonder if these were residences for (senior) staff? My great grandfather went on an “around the world” trip at age 13 with his cousin and Uncle (year 1899). He kept a diary of his trip and wrote about having dinner with Mr Rennie in Hong Kong. They played pool and talked until 11pm. He also noted that Mrs Rennie was nice. Upon reading the diary, I decided to google Mr Rennie and found your post about him. that is so interesting, my aunt used to live in Rennie’s mill community . That is so interesting ! Would you please advise how to obtain or is there any copyright issue on the 1st 1906 flour mills pic in this page if I wish to use that in a short video project of mine about this area? Hope to hear from you soon, thanks a lot! If so there are no copyright issues.